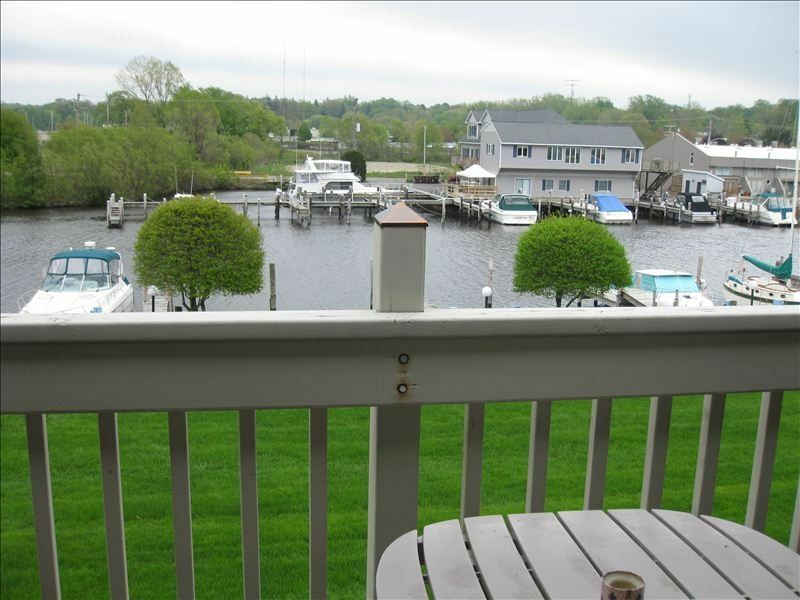 Condo on Black River by Bridge on N Beach Peninsula! JULY & AUGUST ARE WEEKLY RENTALS ONLY!!! Our weekly rate is $1595. We book Sunday to Sunday and we will offer weekends last minute in July & August. We also do weekends all other months. Come spend a relaxing week at our vacation home.The view is EXACTLY as it appears. We challenge you to ask questions to ensure your vacation includes the view and the amenities you are being quoted!! Our condominium is a two level townhouse with the two bedrooms, 1 full bath upstairs and 1/2 bath downstairs. Washer, and dryer located upstairs. The front bedroom has a double size bed. The master bedroom has a queen-size bed and an upper deck with an awesome view of the Black River. Cable TV in master bedroom and living room downstairs. The main level includes a full kitchen with all the amenities. The living room has a flat screen TV/DVD,as well as WIFI... and the lower level deck, also with a view of the Black River which offers a continuous parade of boats. Our vacation home is within two blocks of North beach, two blocks from town, and one block from the park. Leave the car parked and enjoy South Haven on foot or by bicycle.
. We love the community and that's why we live here. We love to share it with others and know how to make your vacation get-away great. You won't find shabby worn out furniture nor will you find claims that are not true. You will find the location and the condo to be delightful and a great find for your summertime play. We are just across the street at our business, Inn at the Park B&B , and available for you 7 days a week. Beach, beach, beach. Sun sun sun, some cocktails, some shopping, and since you are on vacation, why not try relaxing! ?